Hardback. A collection of 12 crimes which have all in their different ways caught the public's attention. The crimes are set all around the world, 3 of them in Great Britain. The murder cases have their individual characteristics. Among those who died were a man who confessed on his deathbed, the Austrian woman who ended on the block giving the Nazi salute and a still unsolved train mystery. Amongst the others were the man who was influenced by marijuana, another who gambled on murder and lost, and the man who was caught with the help of a medium. Other crimes include the man who faced 2 trials after the first jury could not come to a decision, a kidnapping of a well-known movie star, a fantastic skyjack in the South of France, America's most daring robbery and a millionaire who mysteriously vanished in Switzerland. Featuring : George Kelly and Charles Connolly; Martha Marek; Clarence van Buuren; Pat Fullen and Audrey Ruud; Danielle Cravenne; John Starchfield; Karl Angst; Ronald John Cooper; J. Jose, B. Pineda, E. Aquino, R. Canial (Philippines); Shan Mohangi; Harold Loughans. 176pp. 8vo. h/back. 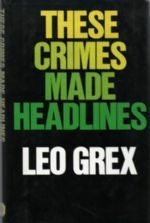 From the library of true crime writer, Wilfred Gregg, with his personal b/plate. V.v. lightly browned edges o/w Nr. F. in sl. sunned Vg+ dw.